This post about two promos to consider shopping this weekend contains affiliate links. Please read this blog’s disclosure post for more info. Black Friday is just a memory and Cyber Week may be coming to an end but there are still fantastic deals to shop this weekend. In fact the deals may keep getting better through the end of January as retailers continue to undercut each other to draw shoppers. There are two promos to consider shopping this weekend. Firstly, Anthropologie has all its sale at an extra 40% off. You’ll find some terrific items hanging out in the sale section albeit it in limited sizes. There are Summer holdovers like the Monterrey Tunic Dress (now $150, above). I see items I’ve had success with, like the Matinee Sweater Dress (now $60, on me here) and the Amelie Octagon Hoop Earrings (now $18, OOTDs upcoming). There are items I might try on sale such as the Marnie Corduroy Jacket (now $54). Below, my picks from the Anthropologie sale. Scroll past that for the second deal I recommend shopping this weekend. Meanwhile, over at Madewell you can take up to 30% off your purchase this weekend. I suppose Madewell is pretty smart doing this promo the week after Black Friday — if you were distracted last week or not ready to buy anything, now’s your chance and at a slightly better discount on bigger purchases. 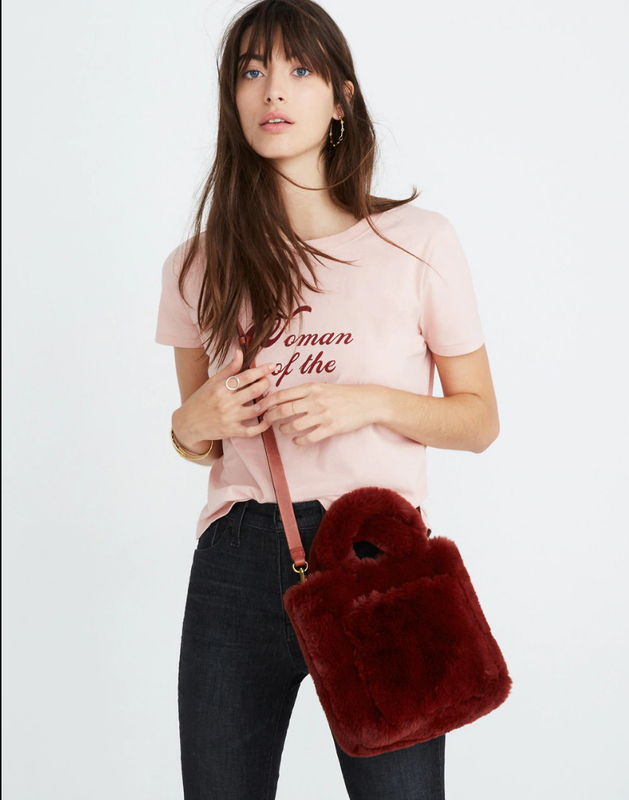 I just did a deep dive into Madewell’s beautiful Holiday 2018 collection so I’ll just highlight a few quick picks here. And one bonus promo worth mentioning too: Take 30% off your J. Crew purchase or 40% off your $200+ purchase. J. Crew is starting to get good again you guys! Hopefully the recent CEO departure does not derail them. True story: I sent my résumé over to J. Crew for the role. I’m not expecting a call back, but it’s a role I’d love to step into. Oh how I wish J. Crew would hire you! I just got an Anthro survey regarding events. They asked what bloggers I followed that I would like to see at an event and I said "Effortlessly With Roxy", of course! I adore you evb. Thank you!! Thank you lulu!! I appreciate you very much too. thank you for this great post Roxy! I was considering the Monterrey Tunic dress and was wondering if you have tried it on and have any size guidance? I've never tried this brand and there are no reviews for this dress. The neck looks low and not sure how well the bodice will fit for a "larger" busted woman. 🙂 Thank you! Hi Guest! I tried on a return of it in a L, which was a little too big on me. I'd have to wear a cami underneath the dress for sure. DHL is THE WORST! I simply won't order anything from Anthro online so no loss there. I ordered something else from the U.S. and they use DHL. It is still stuck somewhere in California and the DHL site is blaming this on Canada Post not accepting international packages. I am not entirely sure what Canada Post has to do with DHL. Oddly enough, Free People seems to be using UPS right now for its international orders. So much for UPS being any better than DHL right now. I placed an order with Free People two weeks ago and it still hasn't been picked up by UPS. Ugh! I know that it is a busy time of year but this is ridiculous. If they could at least give us a choice…anything but forcing us to go DHL. I just wanted to say, I really enjoyed your last two posts, for the message and the inspiration. You rock! Clarification : your last two instagram posts! I don't have an Instagram account, so can't comment there, but I, too, want you to know how much I appreciate your last two posts. Your positive, affirming attitude is the reason I read your blog and check out your instagram on a regular basis and have done so for years. I admire your honesty and fearlessness. You are a beauty, inside and out! Thank you so much maryeb!! I feel the Love you’re sending and I’m sending it right back to you too! Hi not sure if anyone can comment on this at Anthropologie but would love any advice. I called Anthropologie nearly 10 days ago and asked for a sweater I had ordered in a different size. I was told that instead of doing a re-order they would re-ship as an exchange. I’ve called several times since then and they assured me that it’s in process. This morning I received an email from their customer service saying that they will not ship it out because they sent out what I ordered. This makes no sense. At this point I have had such terrible experience With their customer service I almost want to not call again as I don’t know what to say. I don’t really understand why this is what they would say after being assured that they can exchange the item. Has anyone ever had experience with this? So sorry for the above post. I finally got a representative who was very helpful and corrected it immediately. She said it was miscommunication on their end and apologized. I’m happy it worked out but wish there was better consistency on their end (and that my size was still left in stock!). Oh no Guest!! But I'm SO glad to hear that your story has a happy ending. I think Anthropologie is trying to enforce their return policy more strictly which I'm sure is warranted in some cases, but certainly not at the expense of alienating longtime loyal customers. Very happy to come here today and see that your issue has already been resolved!! Thanks so much Roxy! I have been a longtime customer so I was shocked when I heard this, but moreover, that it took so many calls to get it worked out. The last person I spoke with was great and profusely apologized and ordered it immediately so I have a bit more faith! Speaking of Anthro's return policy….I can not believe how LONG in store receipts are now that they are printing the new return policy at the bottom? I know its a minor thing but it feels so wasteful. I bought a greeting card and got a two foot long receipt with it.